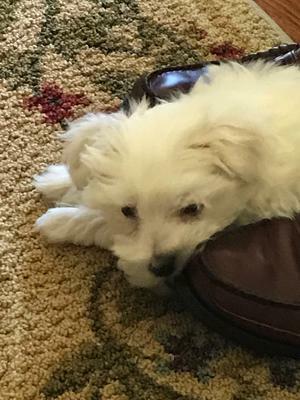 Meet Casper Carl.....he is almost 12 weeks old, and quite the handful for us, as seniors!! Lol! We have not doubt, he will be a great dog, once he is trained and matures a little more!! He is so much fun and affectionate! He flew home to FL,, with my husband, from MA, and did very well!! Comments for Our new puppy!! I, too am a senior and have a 10 month old Coton, Annie. There have been times I felt I may not be active enough for her, but she keeps me moving, so that is a good thing! I am a widow and she is my motivation to keep doing. I don't know what I would do without her! He is cute!! Thanks for sharing.